Your residential search resulted in 17 properties found. Situated on an imposing corner plot in a popular area a spacious and very well presented 5 bedroom detached house which has been freshly decorated to a 'walk in' standard. The property enjoys a 22ft lounge with dining area, separate reception room, newly fitted kitchen and modern en suite. Conveniently located within a short walk of Bamford Primary School and precinct with restaurants and shops. The accommodation comprises: HALL with spindled staircase and cupboard; CLOAKROOM with white WC and washbasin; spacious LOUNGE with DINING AREA having window to front, patio door/window to rear, decorative feature fire surround with marble hearth and back (no flue) and access to the FAMILY ROOM which also has a patio door/window to rear and access to hall; newly fitted KITCHEN with High Gloss fitted units, integral Zanussi electric oven and gas hob plus extractor hood, fridge, freezer, free-standing slimline dishwasher and space for washing machine. The original double garage with roller shutter door still in place has been converted and now comprises STORE with fitted cupboards, STUDY with fitted office furniture and SINGLE GARAGE with boiler and door to side. To the FIRST FLOOR there is a spacious landing with linen cupboard; BEDROOM 1 with a good range of fitted mahogany style furniture and EN SUITE with modern white suite comprising large shower cubicle with electric shower, WC and washbasin; BEDROOMS 2, 3 & 4 with fitted furniture; BEDROOM 5 and BATHROOM with white suite comprising bath with plumbed shower above, WC and washbasin. EXTERNALLY there is a double-width block-paved drive and gardens to front and rear with private aspect at rear. Freehold; Council Tax Band F; Gas central heating with combi-condensing boiler; wood-framed double glazed windows. Occupying a good sized plot on the corner of Highlands Road close to Bamford Chapel and beautiful countryside, a 4 bedroom chalet style detached house in need of full modernisation but offering excellent potential. Both St Michael's and Bamford Academy primary schools are within easy walking distance and buses for Manchester, Rochdale and Bury are close by on Bury & Rochdale Old Road. The accommodation comprises: HALL with under-stairs cupboard and WC with washbasin; good sized LOUNGE; DINING ROOM with double sliding doors from the lounge and door to the KITCHEN which has older style fitted units; MASTER BEDROOM with eaves wardrobe and door to DRESSING ROOM/STORE which has further eaves storage and hot water cylinder; BEDROOM 2; BEDROOM 3 with eaves wardrobe; BEDROOM 4; BATHROOM with white suite comprising bath, WC and washbasin. There are 2 attached single garages, the first having a remote controlled door. The property is freehold; Council Tax Band E; Gas central heating. A very well maintained 1960's 3 bedroom detached house enjoying a good sized plot with beautiful gardens and superb aspect to farm cottages and field beyond. Situated on a much sought after development, the property offers excellent potential to extend. Located a couple of minutes walk from beautiful countryside and within easy reach of a number of popular primary schools, secondary school, buses for Bury, Rochdale, Manchester etc and convenient for shops and restaurants. The accommodation comprises: uPVC and brick built PORCH with tiled floor; HALL with open plan staircase; spacious LOUNGE with window to front and sliding patio door/window overlooking the rear garden; separate DINING ROOM with serving hatch to the kitchen; BREAKFAST-KITCHEN with view over garden, fitted units, double electric oven and ceramic hob; REAR PORCH/UTILITY ROOM with access to garage; BEDROOM 1 with pleasant aspect to front; BEDROOM 2 with built-in wardrobes and cupboards and window to front; BEDROOM 3 with built-in cupboard/wardrobe and superb view over garden and field beyond; BATHROOM with avocado suite comprising bath with electric shower above, washbasin, part tiled walls and boiler/airing cupboard; separate WC. 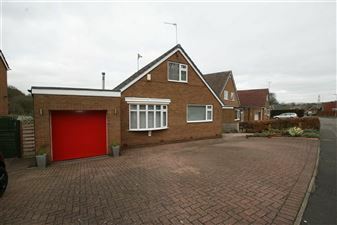 The attached single GARAGE has power, light and access to the house. Long leasehold subject to ground rent of ?12 per annum; Council Tax Band D; uPVC double glazed (excluding garage); Gas central heating (combi-condensing boiler).